The topic of research is a comparative study of ethnicity and general health amongst post-WWII second generation Poles in the UK and the USA. 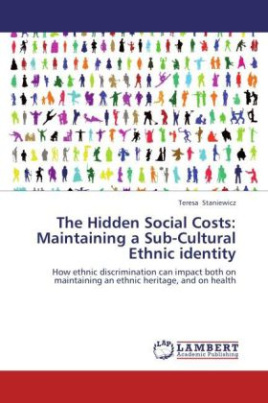 It examines both the level of ethnicity (cultural) maintenance in a white assumed assimilated - minority ethnic group; and, whether it is possible to assess the impact of such maintenance on personal health, well-being, and quality of life. The research design also includes a smaller selection of 1st generation UK and USA Polish respondents which act as a cultural nuances' control group, in order to examine how the two sites accommodated 1st and later 2nd generation Poles. The fieldwork employed 'multi' methods, though was primarily empirical. The results, borne out across social groups, indicate varying degrees of maintained ethnic lifestyles, racial discrimination, and, a presumed impact on some health outcomes. Several differences can be explained by the two different environments, and, the 1st the generations diasporic and exiled community histories. These aside, maintaining one's ethnic roots can for some Poles in the UK and US be just as problematic, albeit in differing ways, as for members of non-white ethnic minorities.